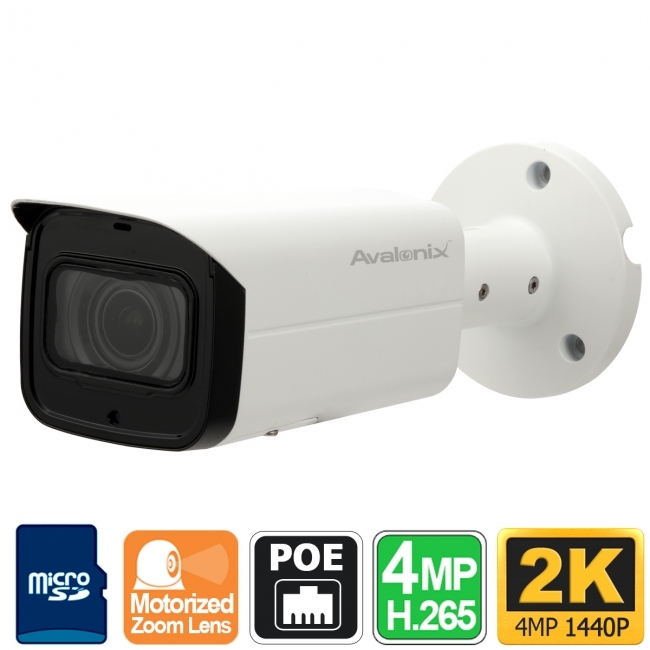 This 4MP Motorized Zoom IP Bullet Camera and its sibling the 4 Megapixel Vandal Resistant IP Dome Camera are affordable PoE IP security cameras with remote controllable variable zoom lenses. You can control the angle of view of the camera from a NVR, from a computer, or from your smartphone or tablet. Once the camera is mounted and set it in the direction you'd like it to look at, you can control the zoom at the touch of a button without having to climb up to the camera and change the lens settings. At the widest setting of 2.7mm, you can expect to have a 100 degree view. When you are zoomed in all the way at the 12mm zoom length, you'll get a 35 degree view and be able to discern fine detail up to 70ft away. The 2K resolution video provided by this HD security camera is twice as detailed as1080p. The on-board 4 megapixel CMOS sensor will provide a 2688 x 1520 pixels picture that allows for digital zoom even after video has been recorded. This increases the likelihood that you will be able to capture faces and relevant detail in the event of a break-in that will lead to swift prosecution of the criminals. Let's not forget this bullet camera has infrared night vision. You can expect the camera to see in complete darkness up to 200ft away. We've tested the camera and recommend it for use in either lit conditions, or in complete darkness. 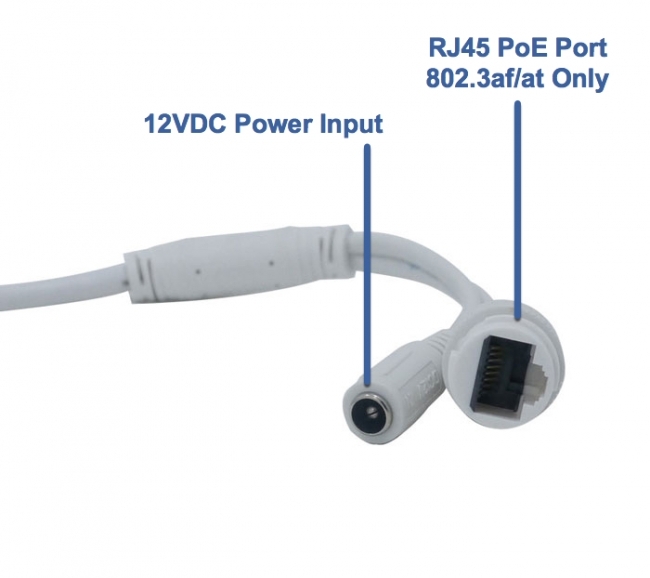 It is easy to provide power to the camera using a PoE Switch, or a 12V DC power adaptor. To record video we recommend using one of our PoE NVR which provide plug & play compatibility with this camera. Dimensions 2.8" x 3.1 "x 8.4"
2.8" x 3.1" x 8.4"
Can this camera be a stand alone w/o an NVR? Does a power adapter come with it? Does it accept a memory card? This camera can be installed and operated without an NVR. You can use an app on your phone to connect or web browser on the computer. It does not come with a power supply, however we do have them available for purchase. You would need a 12V 1Amp for this particular camera. It does not have an SD card slot. For recording, you would need to connect it with an NVR, or use the free SmartPSS software that comes included for use with this camera. I am looking into using this product for computer vision and thus need to know the focal length at all every frame to be able to calculate depth in use of stereo vision. Will I be able to know/extract this information from the camera also when not in its extremal points? We do not recommend this or any other varifocal security camera for computer vision as it will not provide the focal length. You would have to consult a camera manufacturer that supplies equipment for that niche. What type of cable is used here for the video/images? You would use CAT5e network cable to connect to the camera. Is it possible to extract the images without NVR yet still with a cable if the images are to be processed, but not shown on a screen?